A new report reveals who was behind the assassination which led to genocide. But it leaves France with many questions to answer. Few events have been the subject of as many rumours and lies as the assassination on 6 April 1994 of Rwanda's President Juvénal Habyarimana. We may never know the identity of the assassins who fired the two missiles that blew his jet apart as it came in to land at Kigali International Airport; yet this one key event signalled the targeted elimination of Rwanda's political opposition, and triggered the genocide of the Tutsi people. Since that night there has been a ceaseless propaganda war, with each side blaming the other for what happened. One version is that the rebel Tutsi RPF assassinated the Hutu president in a cynical bid to oust his regime; another version blames Hutu extremists who, faced with the possibility of power-sharing with the Tutsi minority, carried out a coup d'etat in order to create a "pure Hutu" state. This is why the publication of an expert investigation into the aircraft crash in Paris today will have such tremendous repercussions. After 18 years it has essentially settled the central question of who was morally responsible for triggering the genocide. 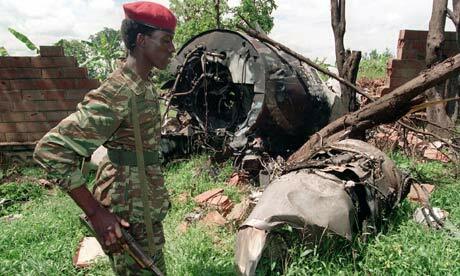 In some 400 detailed pages, including the conclusions of six experts who visited the crash site in 2010, the report has provided scientific proof that, as the plane made a final approach, the assassins were waiting in the confines of Kanombe military camp – the highly fortified home of Rwanda's French-trained elite unit known as the Presidential Guard, and which is directly under the flight path. This secure military barracks would have been inaccessible to RPF rebels, a point made some years ago in a report on the crash produced by the Rwandan government. The government will feel vindicated, but it will be keen nonetheless to consign this episode to the history books: its priority remains to create a united society. In France the report is likely to cause considerable embarrassment – certainly and most immediately for Judge Jean-Louis Bruguière, an investigating magistrate who first looked at the assassination in 1997 and was convinced the missiles were fired by an RPF hit-squad from a farm near the airport. In his own report he named current Rwandan government officials, including the head of Rwanda's army, as being responsible, and in 2006, amid worldwide publicity, he issued nine international warrants for their arrest. There was a storm of outrage in Kigali and diplomatic ties with France were broken, although there has since been a rapprochement. But the Bruguière report did not stand up to the slightest scrutiny. He had relied on the testimony of former RPF soldiers who claimed firsthand knowledge but who eventually retracted their testimony. A new investigation by Judge Marc Trévidic and his colleague Nathalie Poux began in 2007. Trévidic's reputation was as a fiercely independent investigator: Paris Match called him a "judge who defies state power". It is ironic, given the murky past of France in Rwandan affairs – and France was the staunchest of allies to the Hutu regime in Kigali – that the truth of the assassination seems to now reside in the hands of French lawyers. There are certainly implications for those French military officials and politicians who were involved in the foreign policy towards Rwanda in 1994, and the report will do nothing for the reputation of President François Mitterrand, who ran the secretive Africa unit at the Elysée Palace and who steadfastly supported the Hutu regime. France's policy towards Rwanda has for years remained unaccountable to either parliament or the press. This week's report will certainly give pause for thought for defence teams at the international criminal court for Rwanda, where the Bruguière report has become the cornerstone in many cases. Rwandans facing genocide charges have for years accused the RPF of the assassination, claiming the Tutsis were killed not as the result of a conspiracy to murder but in spontaneous revenge attacks by Hutus devastated at their president's murder by Tutsis. In spite of the new information, there remain some difficult questions. On the night of the crash there were senior French military officers living in the Kanombe camp embedded with the Rwandan elite units. As UN peacekeepers were prevented from getting to the wreckage these French officers are said to have taken away the cockpit voice recorder and black box. And no one has yet identified a group of French military officers who, within hours of the crash, had approached the commander of the UN Mission for Rwanda, offering him a team of French aviation experts to enquire into the crash, an offer Dallaire immediately refused. Sooner or later the truth will emerge about how the misleading Bruguière report came to be written, and why over so many years so many people were taken in by it. The story is far from over.